EEF1G is a subunit of the elongation factor-1 complex, which is responsible for the enzymatic delivery of aminoacyl tRNAs to the ribosome. This subunit contains an N-terminal glutathione transferase domain, which may be involved in regulating the assembly of multisubunit complexes containing this elongation factor and aminoacyl-tRNA synthetases.This gene encodes a subunit of the elongation factor-1 complex, which is responsible for the enzymatic delivery of aminoacyl tRNAs to the ribosome. This subunit contains an N-terminal glutathione transferase domain, which may be involved in regulating the assembly of multisubunit complexes containing this elongation factor and aminoacyl-tRNA synthetases. Publication Note: This RefSeq record includes a subset of the publications that are available for this gene. Please see the Entrez Gene record to access additional publications. Sanders J., et al. (1992) Nucleic Aciads Res. 20: 5907-5910.Koonin E V., et al. (1994) Protein Sci. 3: 2045-2054. Western Blot analysis of EEF1G expression in transfected 293T cell line by EEF1G monoclonal antibody (M01), clone 3F11-1A10.Lane 1: EEF1G transfected lysate(50 KDa).Lane 2: Non-transfected lysate. Western blot analysis of EEF1G over-expressed 293 cell line, cotransfected with EEF1G Validated Chimera RNAi ( Cat # H00001937-R01V ) (Lane 2) or non-transfected control (Lane 1). 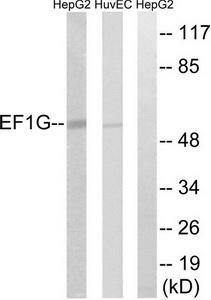 Blot probed with EEF1G monoclonal antibody (M01), clone 3F11-1A10 (Cat # H00001937-M01 ). GAPDH ( 36.1 kDa ) used as specificity and loading control. EEF1G monoclonal antibody (M01), clone 3F11-1A10. Western Blot analysis of EEF1G expression in NIH/3T3(Cat # L018V1 ). 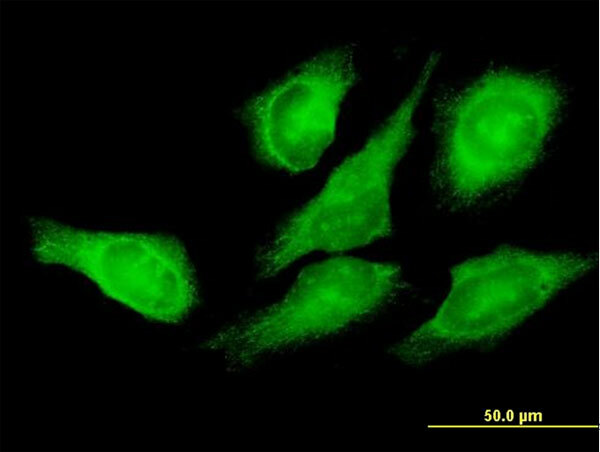 EEF1G monoclonal antibody (M01), clone 3F11-1A10. 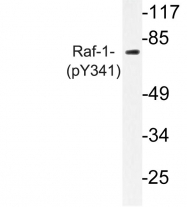 Western Blot analysis of EEF1G expression in Raw 264.7(Cat # L024V1 ). EEF1G monoclonal antibody (M01), clone 3F11-1A10. Western Blot analysis of EEF1G expression in HepG2 ( Cat # L019V1 ). EEF1G monoclonal antibody (M01), clone 3F11-1A10. Western Blot analysis of EEF1G expression in 293 ( Cat # L026V1 ). EEF1G monoclonal antibody (M01), clone 3F11-1A10 Western Blot analysis of EEF1G expression in HL-60 ( Cat # L014V1 ). 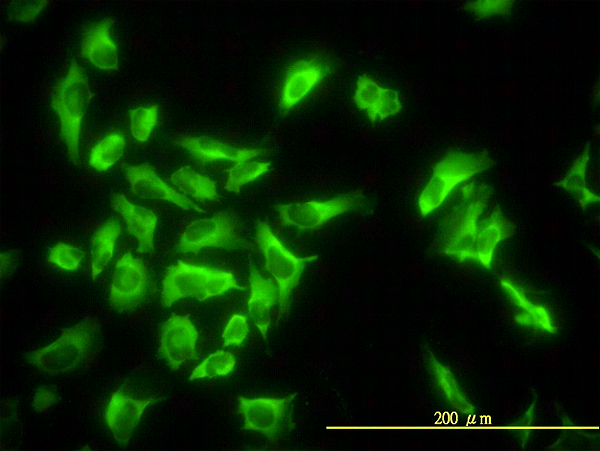 EEF1G monoclonal antibody (M01), clone 3F11-1A10. 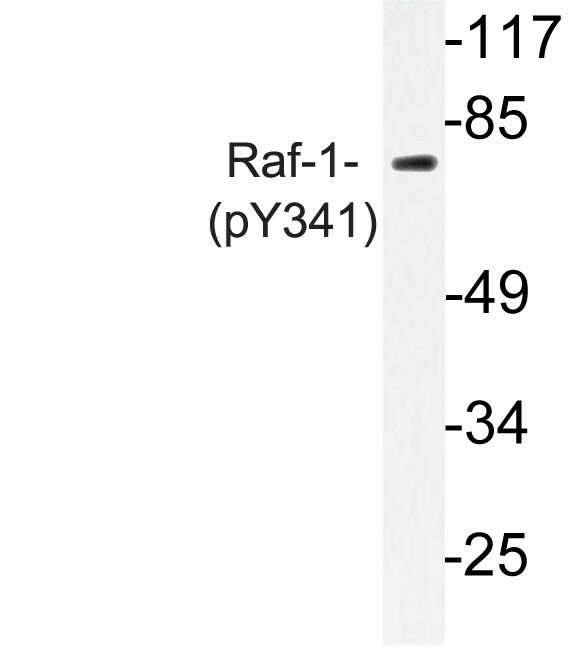 Western Blot analysis of EEF1G expression in PC-12(Cat # L012V1 ). EEF1G polyclonal antibody (A01), Lot # 061025JCS1 Western Blot analysis of EEF1G expression in A-431 ( Cat # L015V1 ). 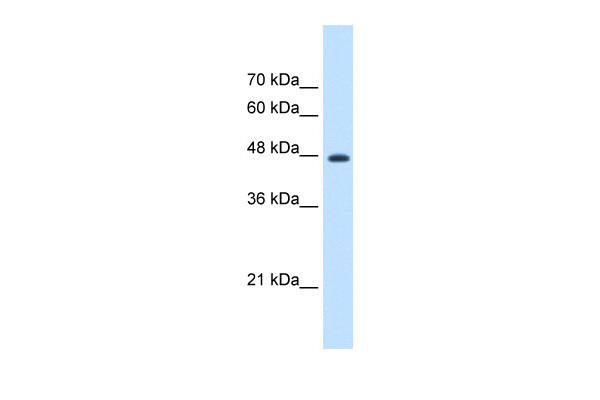 Western Blot analysis of EEF1G expression in transfected 293T cell line (H00001937-T01) by EEF1G MaxPab polyclonal antibody.Lane 1: EEF1G transfected lysate(48.18 KDa).Lane 2: Non-transfected lysate. Western Blot analysis of EEF1G expression in transfected 293T cell line (H00001937-T02) by EEF1G MaxPab polyclonal antibody.Lane 1: EEF1G transfected lysate(50.10 KDa).Lane 2: Non-transfected lysate. 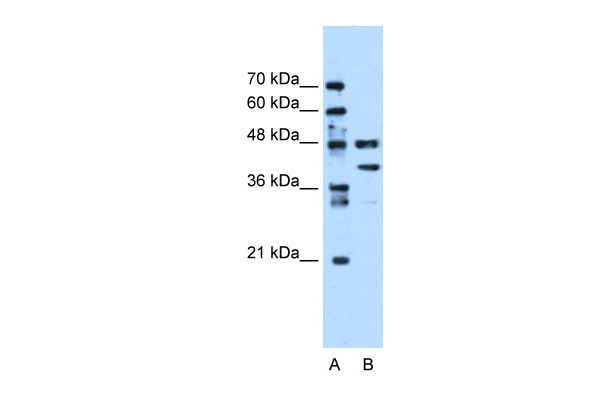 Western blot (WB) analysis of EF-1 γ antibody (Cat.-No. : AP21172PU-N) in extracts from Hela cells. Western blot analysis of extracts from HuvEc/HepG2 cells, using EEF1G Antibody. The lane on the right is treated with the synthesized peptide. Western blot analysis of EEF1G expression in HeLa (A); HepG2 (B); HL60 (C) whole cell lysates. Western blot analysis of extracts from HepG2 cells and HUVEC cells, using EEF1G antibody.The lane on the right is treated with the synthesized peptide.